English ivy (Hedera Helix), an evergreen climbing plant native to Europe, produces ornamental foliage in a wide range of shapes and colors, depending on variety. Commonly grown outdoors as a ground cover, English ivy also thrives indoors as a houseplant and requires only minimal care. Tolerant of cool temperatures, the plant prefers indoor placement near doorways and cool windows where other plants may fail. English ivy reaches up to 8 inches high when grown as a houseplant and may produce small, whitish-green flowers in the fall with proper care. Grow English ivy in a 6- to 9-inch container filled with one part potting soil, one part peat moss and one part perlite to provide proper drainage and fertility. Keep the plant in a location that receives bright, indirect light. Avoid direct sunlight during the spring and summer, as it may burn the plant's leaves. Maintain a constant temperature of 65 degrees Fahrenheit during the day and 50 degrees Fahrenheit at night. 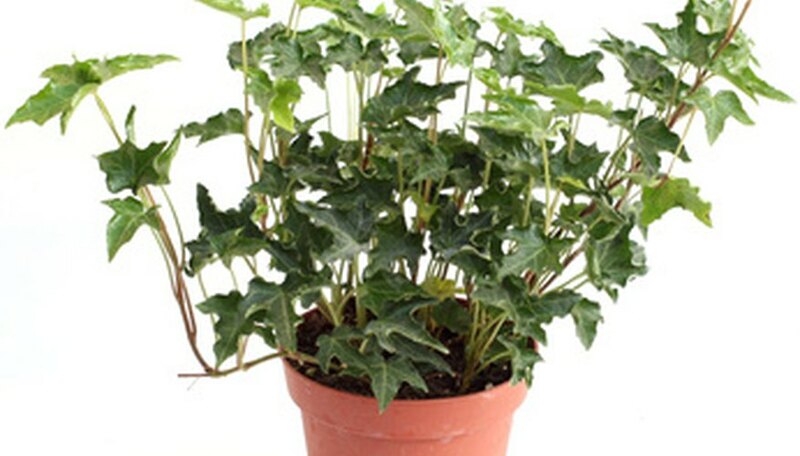 Ivy may tolerate slightly lower or higher temperatures for a short time, but performs best in this range. Keep a thermometer near the plant to monitor the temperature if desired. Water English ivy once every seven days, just enough to keep the soil evenly moist, but not soggy or wet. Over-watering may cause the plant's leaves to yellow. Soak the soil until water begins to exit the bottom of the container, then drain away all excess moisture. Feed the plant every two weeks from March until September using a standard liquid houseplant fertilizer diluted to half the recommended strength. Follow the instructions on the label for proper application. Prune English ivy during early spring before active growth resumes to improve the plant's visual appearance and health. Remove all weak and spindly growth, and cut back any excessively long vines using pruning shears. Re-pot the plant during early spring whenever it has outgrown its current container, usually once every one to two years. Increase the container's size by about 3 inches and provide a fresh growing medium to ease the shock of the transfer. English ivy benefits from one to two hours of direct sunlight a day during winter. The sap from English ivy leaves may cause skin irritation. Always wear gloves when handling the plant.